Josh Elliott has been drafted into the Tyco TAS BMW team for this weekend's British Superstock round at Knockhill. The 23-year-old won the 1000cc series in 2015 and rode for the Moneymore-based outfit the following season, but found himself without a ride this year. Elliott finished fifth in the series in 2016 after one win and five podiums. 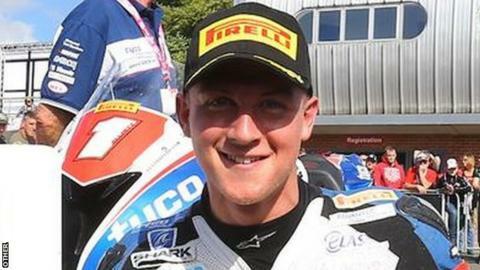 The Fermanagh rider stands in for Ian Hutchinson, who suffered a fractured femur in a crash in last week's Senior TT on the Isle of Man. "I'm really looking forward to working with the TAS boys again - I know the team and the bike well, and I also know what I'm capable of around the Scottish circuit," said Elliott. "I'm confident we can get into the ballpark quite quickly, but we could do with some consistent weather to help make things a little easier. "I haven't been riding this season but I've been keeping myself fit, and with the new format in the Superstock class giving me two bites at the cherry, I'm confident we can be up there challenging." "I'd obviously like to thank TAS Racing for the opportunity to work with the Tyco BMW team again. It will be great to be back on the British championship grid."